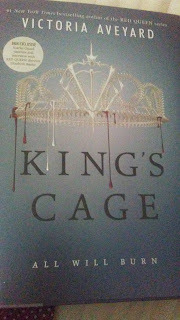 Today I will be reviewing King's Cage by Victoria Aveyard. Sorry for the bad photo quality, I took it and didn't have a better straight on pic of the cover. So the first thing that I would like to say is that I love how much Victoria Aveyard's storytelling has improved in a mere two books, you can really see the advancements. I thought that the plot was intriguing, there were at times where I seemed to think, "Why is this necessary to be here?" but then later in the novel it all was explained. Which is what I also really liked about this book, that there were things that came up and they were explained in the book in a way that seemed refreshing and just... good. The characters and the character development, which coincides with that, were once again, great. I loved how Cal and Mare's personas bounced off each other in a way (does that even make sense?) and I really liked how Cameron evolved throughout the novel because I gotta say, wasn't my favorite in Glass Sword, but I did enjoy her more in this book. I didn't exactly love the "dual" sometimes triple point of views, but I saw why Aveyard did that because it makes sense to the story and it has to be that way to actually have a functioning novel. The only thing that I really did not like about this book was just the layout of the plot. It felt as if it should have ended in the middle of the book, and then after the event that made me want it to end there, it felt like the beginning of a novel, which was very confusing. 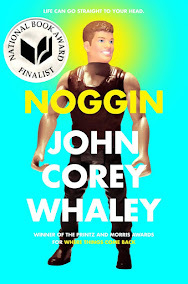 So that was really the only thing that I REALLY didn't like about this novel. I didn't hate, yet didn't love the ending to it as well though. You'll probably see why. But there are more books so come to sort some of that stuff out. That's the end of the review, if you want to check out my review for Red Queen or Glass Sword, just click on the names and it will take you to my reviews for them.